You are here: Home / News / Top Stories / SCF News / RAISE Interns Tour Fort Lewis College, Travel to Washington D.C.
RAISE Interns Tour Fort Lewis College, Travel to Washington D.C. Between March 10–17, six winter interns went on an educational tour of Fort Lewis College in Durango, Colorado. 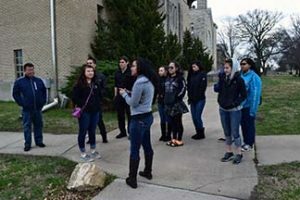 Fort Lew is College fosters the academic success and personal development of Native American students and is a liberal arts college. A former RAISE administrative assistant hosted interns and provided a tour. She shared tips on how to best utilize resources at the college and how to succeed at the university level. Interns visited the Native student services lounge and listened to a Native student advisor, who gave information about how to apply for scholarships, and what to experience for the first year in college. Interns next traveled to Washington D.C. to participate in the Close Up Program, which gives students skills and experiences to advocate for issues important to them and their Tribes. Interns were provided training regarding how the federal government operates and how Tribal government works. Interns participated in a congressional simulation exercise with students from other parts of the United States, to raise aware ness about how congress works. The debate structure was modeled after the process used in the U.S. House of Representatives to pass bills. This particular simulation was focused on S.1419 Native Language Immersion Student Achievement Act. A RAISE intern led the debate for passage of S.1419 and at the conclusion of the debate, the participants voted. The resulting vote was 130 yay to 27 nay votes. Interns also toured national monuments and had the opportunity to meet Alaska’s U.S. Senators as well as Congressman Young. 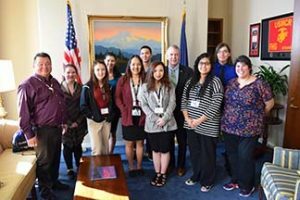 The interns demonstrated their keen interest in the trainings and workshops, as they asked questions and expressed their concerns about the future of Alaska. FWWI Extending Reach to Rural Communities Congratulations to the May 2017 DAT Program Graduates!